I love this picture, it brings back great memories. I messed up my daughters jewelry to photographed my soaps. I laugh every time I look at it, remembering her face when she saw what I had done. (I should have taken a picture of that!) This is the perfect picture to showcase my favorite soap. 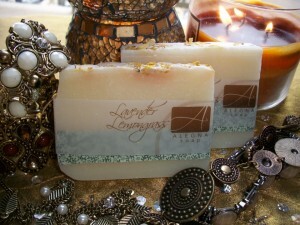 I’ve decided to pick one of my soaps each month and tell you about how they came to be. Each one does have a story. January is the month of Lavender Lemongrass. It was the first scent I blended for my soaps. Mixing essential oils for soap scents is probably my favorite thing to do. Took me a few tries to get the exact scent I wanted. First too much lemongrass, then too much lavender. I tried adding a little litsea to see what would happen and thought it was result was interesting. I love that the lavender is calming, while the lemongrass is uplifting. Every time I breathe in the scent I’m taken back to the few times I’ve done spa treatment. (Note to self-schedule more of those fancy treatments!) To finish off, I added a dusting of calendula to the top. This soap is made with organic olive oil, organic coconut oil, organic palm oil and organic shea butter. It makes my morning shower something to really look forward to.